I don't understand how you could be anything but delighted by Yoshi's Crafted World. Yes, it's not challenging (play the upcoming Cuphead for that), nor is it especially deep. That's because Nintendo made this one so that everyone, of all ages, can enjoy it. You'd need to be a pretty selfish person to suggest that's not a good thing. If you're fixating on what Yoshi's Crafted World is not, over the warmth and charm of Yoshi and his antics, and the blissfully creative level design, then you're doing yourself a disservice and missing the point of Yoshi's latest adventure. 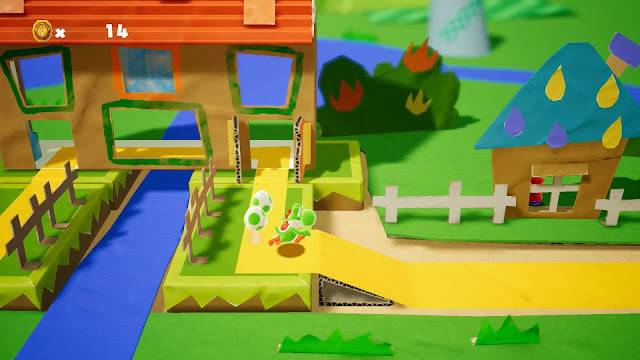 The most immediately notable thing about Yoshi's Crafted World is the handcrafted visual aesthetic. Nintendo has been using handicrafts as a recurring visual motif for game design across both Kirby and Yoshi titles for a while now, and this time around, there's a felt material aesthetic to the characters, set against a world that looks like it has been created in papercraft. It's a brilliant visual effect. Typically, video games are so completely artificial in the way that they're filled with fake people and environments, rendered with the assistance of technology and other tech tools. 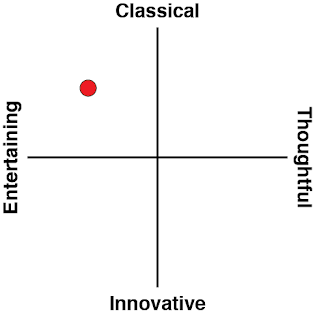 On a fundamental level, the artistry of video games is a cold and scientific one as a result. Games are often impressive from a technical standpoint, but they lack the sense of a direct human's touch that makes the experience of walking through an art gallery such a powerful experience. Yoshi's Crafted World is built using the same technology as other games of course, but it's also a game that tries to hide that, rather than celebrate it. Consequently, the hand-crafted aesthetic is warm and inviting one - one that distances Yoshi's Crafted World from the artificiality of most of its peers. Yoshi looks like a cute toy that someone might knit as a hobby. The papercraft environments really do look like they were snipped out by hand. It's a grounded, subtle effect, but it makes the game that much more approachable. 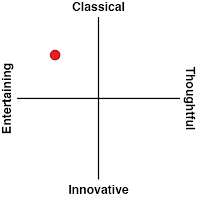 That approachability is backed up by the game's design, which focuses on simple, low-pressure activities. 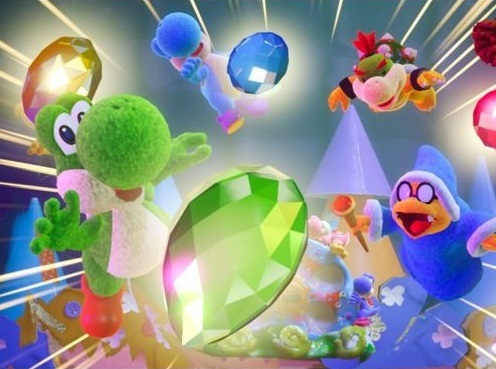 Yoshi's Crafted World doesn't have time limits, nor does it feature a significant level of challenge. What will consume most of your time while playing is in looking for the collectibles scattered through the environments. Some are hiding in plain sight, and figuring out how to reach them requires some very light puzzle solving. Others are hidden, and rely on Yoshi interacting with the environment in some way to reveal them. 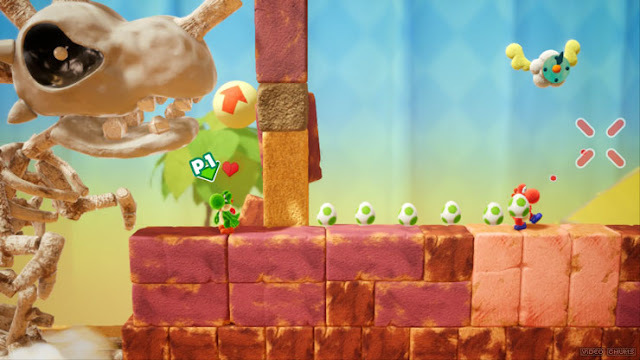 That's more testing a player's ability to be observant; there's so much that Yoshi can interact with that you'll really need to pay attention to those environments to spot everything. Don't think that the simplicity of these challenges will lead to boredom, though, because Nintendo's at its creative best with the mechanics of Yoshis's Crafted World. Nearly every level introduces some kind of new feature or quirk, forcing you to look at the environments in a new way all over again. I was less impressed when Nintendo broke away from standard platforming entirely for what can only be described as "non-standard" levels. There's an on-rails shooter level, for example (with Yoshi tossing eggs rather than using guns, naturally). Another has a stealth ninja theme, with Yoshi skulking around behind screens, and the action occurs in silhouette. Nintendo was trying to break up the standard platforming with these levels, which is noble enough, but I didn't find them to be as tightly designed as the basic platforming stages. They're still a delight on the eyes and ears, though. Making things even cuter is Yoshi's ability to wear costumes. These costumes work as armour which helps Yoshi take more damage before being defeated, and are, mechanically, something completely optional for people who need a little bit of assistance in a level. But, given that no level is going to really test an experienced player, there's no reason not to use these costumes anyway, and the visual delight of watching Yoshi run around wearing a cardboard trashcan or box house design is unparalleled. There's a huge range of these costumes to unlock, and are a great way to spend the coins you earn through play. With some levels, once you've completed them once, you can play a "flip side" version, with a different set of things to collect. Rather than being a "hard mode" as you might expect from other platformers, this is presented more as a treat to see the "behind the scenes" of a level, and in playing them these levels help to build on that hand-crafted theme. It's a subtle and creative way to add those replay features that are expected of platformers these days without doing so through added difficulty. For those that are finding Yoshi's Crafted World a challenge, there are multiplayer features, as well as "easy mode" which helps Yoshi jump further. No one should get frustrated in playing this game, and it's this kind of game that can be a magical way for parents to bond with their young children, or for someone with a non-gaming partner to enjoy playing a game together. Perhaps the best thing about Yoshi's Crafted World is that it doesn't generally feel like a game at all. It's more a digital toybox, and whether you're nostalgic for your youth, or still lucky enough to be at that point in life, Nintendo has you covered.